Ha ha ha everybody has thinking about the same in same time. It's so cold in Europe actually that we all think about warm cltohing ha ha ha. Oh, how I would wear that today with pleasure! Oh how darling and cozy looking! What a fabulous toasty coat! What colors would you guess for the bold stripes? Muted primary colors, like in the pattern illustration? Isn't darling? 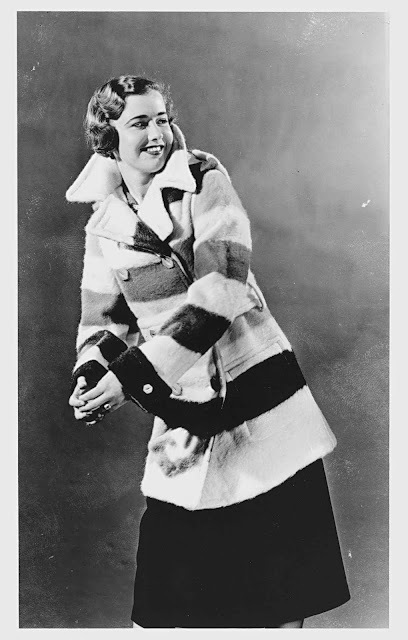 If it's a true Hudson's Bay Blanket Coat, then they would indeed be stripes in those primary colors! Great photo! I wish I had that coat! Vintage B&W Photography is so lovely! This coat often appears in my dreams. Oh how I wish I could have one.